← Walsall wildlife watchers – keep ’em peeled! I’ve been sent some very good news from the fight to save Brownhills Senior Citizens Centre, which as regulars will know has been threatened by the planned new Tesco development in the town. The well-loved and extensively used facility is pencilled in for demolition to make way for a small overflow car park for the new store, as a result of a peculiar land-swap deal between the retail behemoth and Walsall Council. 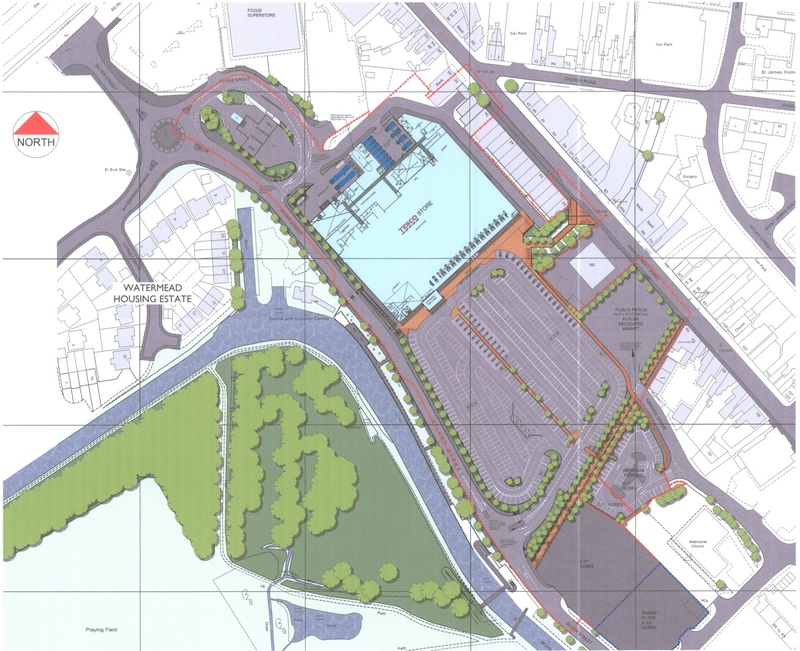 It would appear that the authority, in their wisdom, had agreed to swap the site of the centre for a patch of wasteland no longer coveted by the developers, upon which a relaunched Brownhills Market market could apparently be sited, despite the plans for the new building leaving the existing marketplace undeveloped. As I pointed out previously, demolition of the centre seems little more than gratuitous, particularly when it’s hard to see what Tesco will be giving in return for remodelling our town in their image. Councillor Cassidy, John Dunn and Brownhills Senior Citizens Club present a formidable front. Photo from press release. Pensioners fighting to save their Brownhills’ centre from the bulldozer may have won their fight with Walsall council and the supermarket giant Tesco. 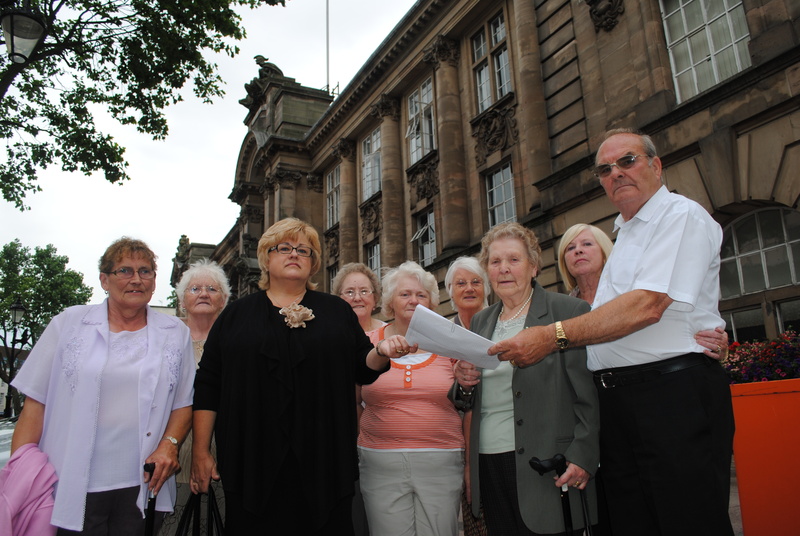 Members of the Brownhills Senior Citizens Club were told the news as they presented a 350 named petition to Labour party councillor, Barbara Cassidy, before Monday night’s full council meeting. The OAPs got signatures from across the local community opposing a proposed land swap between the local authority and Tesco which is part of a proposed 88,587sq ft store with over 500 parking spaces. Tesco had said the scheme required the pensioners’ council owned centre on Pier Street be transferred to them so it could be demolished. Cllr Cassidy who was asked by the pensioners to highlight their plight, said she was pleased the weight of publicity and public outrage had lead to the change of heart. ”Since the local media published this story, the Brownhills Senior Citizens Club has had tremendous support from the people of Brownhills and Walsall Wood. Saying the club members had shown real grit, she added “Far from being intimidated by taking on the council and one of the country’s biggest companies these senior citizens have shown they know what they want and they are determined that no-one is going to walk all over them. I welcome this news, and also echo the note of caution. Walsall Council say lots of things, but the actuality is often different. With an authority that seems inexplicably eager to please Tesco, it remains to be seen if they will do the honourable thing for the community or just roll over as they have before. I fully support the club in it’s fight and would like to take this opportunity to congratulate it’s members and Councillor Cassidy, who has really fought on this one. Myself and Barbara don’t always see eye to eye, but on this one it seems like common sense may yet win the day. Well done to all concerned. Remember, this whole deal isn’t over. Tesco still seem set to take up a huge swathe of Brownhills whilst apparently feeding little back into the community. This development will demolish Ravens Court and replace it with just three new units, effectively sealing Tesco off from the High Street, whilst removing the focus of the town. I would be the first to admit that the dilapidated shopping centre requires demolition, however I’m sure that better replacement solutions could be explored. I remain concerned as to why the town seems to be getting so little from the deal. Whatever happens, we’re unlikely to see a new store before 2013, in the meantime Brownhills remains in limbo, haemorrhaging trade and investment. Stay tuned, folks, this is set to get quite interesting. This entry was posted in Brownhills stuff, Environment, Events, Followups, It makes me mad!, Just plain daft, Local media, Local politics, planning, Shared media, Spotted whilst browsing the web, Walsall Council and tagged Barbara Cassidy, Brownhills, Brownhills Market, Brownhills OAP's, Brownhills pensioners, Brownhills Senior Citizens Club, Derelict, John Dunn, Local politics, Petition, planning, Politics, Ravens Court, Redevelopment, Tesco, Tesco Development, Walsall, Walsall Council, Walsall politics. Bookmark the permalink. I can only repeat that which I have said before about this development. Hereford City squeezed ASDA for everything going which incuded the cost of road alterations, flood defences AND a local Community Centre. I would push Walsall Councillors to do the same. Tesco will make more out of this deal than the people of Brownhills. Nice to see Councillor Cassidy doing more in Brownhills than where she lives in Brownhills West..
Where the kids get bus shelters invaluable to the elderly and disabled taken down. The ‘park’ where kids are now playing has no fence around it, causing half the kids to run into the road and near run over by innocent drivers and where litter and pot holes are rife. So in touch with the people are these Councillors these days. As for Tesco, as Arkrite said, squeeze them for every penny. Instead of squeezing the tax payer (Walsalls council tax is one of the highest in England). At least Tesco have set aside a place for a plausible market site, and most likely won’t charge what Walsall Council do for a pitch! I don’t think you’re being entirely fair to Barbara there. I have issues with the councillor sometimes, but this isn’t entirely reasonable. The senior citizens centre is a facility for all pensioners, including those from up west. Te residents campaigned for the removal of the shelters. Damned if they do, damned if they don’t. The potholes are the fault of the council, who will not ensure they are repaired, or when they are, that it is done properly. Barbara is an opposition councillor and isn’t responsible for such policy. Tesco haven’t set aside anything. Read the material. Tesco currently own the wasteland by Kwik-fit. They don’t want it anymore, and have agreed to swap it with the land the centre stands on, so that they can build an overflow car park on it. The new ‘market site’ will then be owned by the council, who might operate a market there if they remember. Tesco will have no involvement in the market.